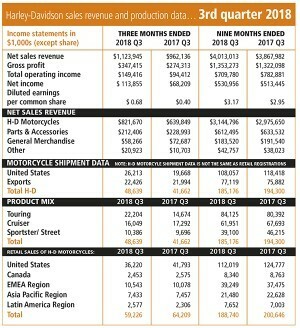 Harley-Davidson has announced its Q3 financial results, and while it is reporting that international retail motorcycle sales were up +2.6 percent compared to 2017, retail sales in the United States were down -13.3 percent, putting worldwide retail sales down overall at -7.8 percent. The domestic U.S. 601+ cc industry was down -9.8 percent in the third quarter compared to 2017. Harley-Davidson's third quarter U.S. market share was 50.9 percent, while Harley-Davidson's European market share was up +0.8 of a percentage point to 10.4 percent through September. Third quarter revenue from the Motorcycles and Related Products segment (Motorcycles segment) was up versus the prior year. Operating margin as a percentage of revenue increased in the quarter compared to 2017 due to higher gross margin and lower SG&A as a percent of revenue. &quot;Third quarter progress tracked to our plans with numerous highlights including another quarter of improved international retail sales growth and increased year-over-year earnings per share. 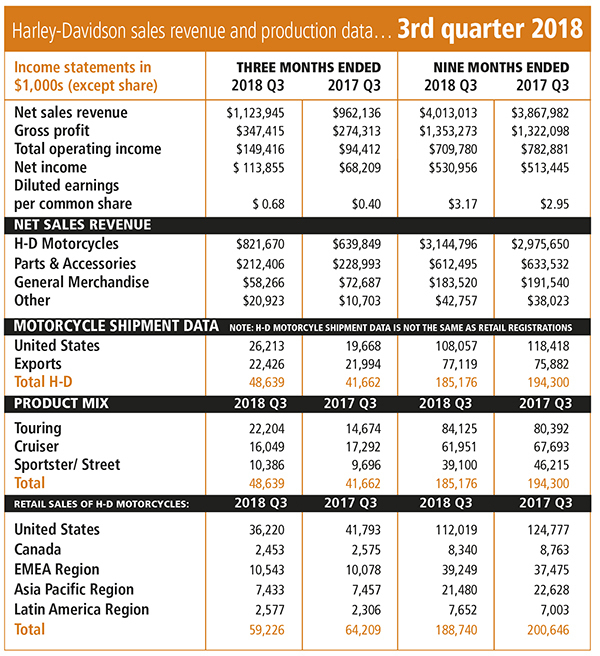 We unveiled our More Roads to Harley-Davidson accelerated plan for growth, and made strong progress already through September,&quot; said Matt Levatich, President and Chief Executive Officer, Harley-Davidson, Inc.
On a discretionary basis, Harley-Davidson repurchased 1.9 million shares of its common stock during the third quarter for $84.5 million. During the quarter, there were approximately 166.7 million weighted-average diluted common shares outstanding. At the end of the quarter, 21.3 million shares remained on board-approved share repurchase authorizations. During the quarter, Harley-Davidson says &quot;we have made progress on the initiatives included in our More Roads to Harley-Davidson accelerated plan for growth to build the next generation of riders globally. Leveraging core strengths in the business, brand and dealer network, the company is investing in opportunities that inspire increased ridership sooner and deliver sustainable growth for the future.&quot; Harley-Davidson's More Roads plan supports the company's strategy and 2027 objectives to: build 2 million new riders in the U.S., grow international business to 50 percent of annual volume, launch 100 new high impact motorcycles and do so profitably and sustainably. Through 2022, the company's More Roads to Harley-Davidson plan will is slated to deliver new products to keep current riders engaged and inspire a new generation of Harley-Davidson riders; broader access, meeting customers &quot;where they are and how they want to engage with a multi-channel retail experience&quot; and stronger dealers - driving a performance framework to improve dealer financial strength and the Harley-Davidson customer experience The company believes its accelerated plan will drive revenue growth and expand operating margins. The company expects to fund strategic opportunities while maintaining its current investment and return profile and capital allocation strategy. &quot;In the third quarter, we delivered new products and innovations with our model year 2019 motorcycles and engaged our dealers to support bringing the LiveWire electric motorcycle to market in 2019. Our brand and select products are now also accessible through a Harley-Davidson branded Amazon storefront in the U.S and significant support programs and dealer incentives were implemented to strengthen the dealer network - the hub of our customer experience,&quot; said Levatich. As Harley-Davidson continues to build the next generation of riders globally, the company increased its reach and impact through the third quarter and delivered a wide range of results including 260,000 visitors to 115th anniversary celebrations in Milwaukee and Prague, 43 million social video views and over 200 million media impressions from #FindYourFreedom content, and expanded access to Harley-Davidson through an Amazon storefront, new international dealers and new urban apparel stores in Asia. In other results the operating income it the company's Financial Services segment increased +8.7 percent in the third quarter compared to 2017. Harley-Davidson's year-to-date effective tax rate was 23.1 percent compared to 33.2 percent in 2017, primarily due to the favorable impact of the 2017 tax cuts. Cash and marketable securities were $937.0 million at the end of the third quarter 2018 compared to $683.1 million in 2017. Through September, Harley-Davidson generated $1.12 billion of cash from operating activities in 2018 compared to $949.1 million in 2017. The company paid a cash dividend of $0.37 per share for the third quarter, and a cumulative total of $1.11 per share for the first nine months of 2018. For the full year 2018, the company says it continues to expect motorcycle shipments to be approximately 231,000 to 236,000 motorcycles. 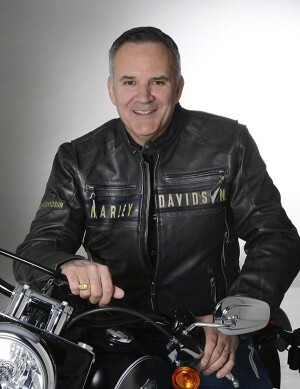 In the fourth quarter, the company expects to ship approximately 45,800 to 50,800 motorcycles and for motorcycles segment operating margin as a percent of revenue to be approximately 9 to 10 percent; capital expenditures of $230 million to $250 million are expected, including approximately $50 million to support manufacturing optimization (compared to its previous expectation of $250 million to $270 million).